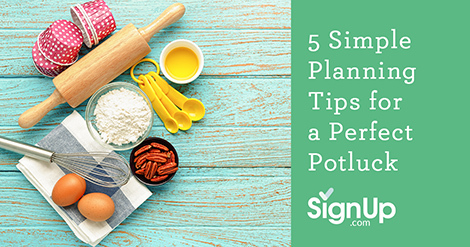 The most important elements for planning any successful potluck party are communication and organization and a central place to keep track of the details. Luckily, everything you need is provided for you in one central spot at SignUp.com. Organizers find every tool from suggested SignUp lists to adorable printables to make the potluck meal fun and easy for everyone! 1. Take advantage of online potluck SignUps. Schedule all your potluck needs quickly and easily at SignUp.com. Participants can manage their commitments from their mobile devices and will receive automated reminders. And it’s all free of charge! Try SignUp.com now for the quickest path to peace of mind around your event. 2. Make food labels and card holders. Another essential ingredient for the perfect potluck is to have clearly labeled food and drinks. Give your guests peace of mind in knowing which dishes meet their dietary restrictions. Make sure the dishes that contain nuts or other common allergens are clearly marked. Click here for cute printable food cards and labels. 3. Don’t forget the kiddos! If your potluck event will include children, why not add a kiddie table with some special kid-friendly treats and activities? This will help the parents relax and will ensure that everyone has a good time. Include coloring pages and crayons, small-bite treats, and plainly seasoned food for sensitive palates. 4. Decorate, decorate, decorate! Once your food is organized and planned, you’re free to concentrate on décor. A simple Google search will give you thousands of ideas for decorating according to your theme, adding a festive flair to your potluck event. Best of all, you can add those items to your SignUp.com list so that other participants can share in the fun! 5. Plan for Emergencies. Have a “just in case” bag stocked with extra napkins, paper towels, toothpicks, tape and a permanent marker for labeling containers. You can add extra snacks like crackers, chips and nuts just in case you’re short of food, and a few dollars in case you need to ask someone to make an ice run.